What is the Creative Canvas? The Creative Canvas is an idea exploration and planning tool for creative projects. Like an artist’s canvas, it is a place to turn your creative inspiration into reality and share it with a wider audience. 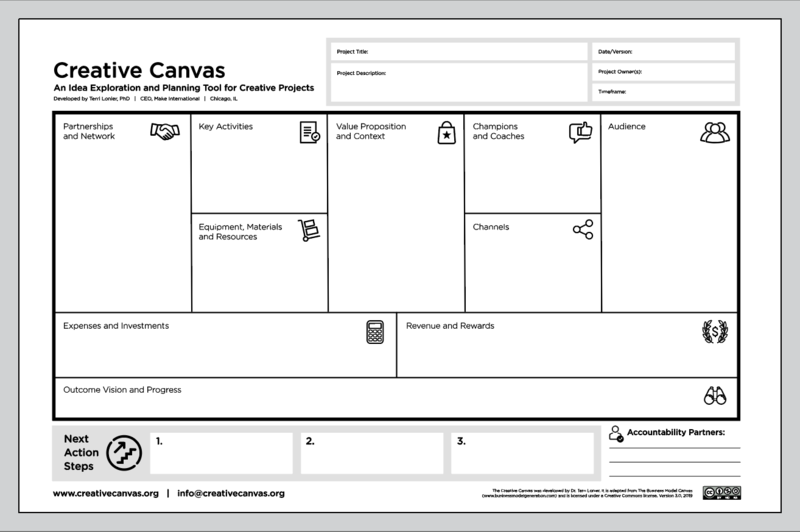 The Creative Canvas — an adaptation of Alexander Osterwalder's Business Model Canvas (BMC) and Ash Maurya's Lean Canvas — is designed for individuals working in creative disciplines. The original BMC, developed in 2008 with a global crowdsourced collective of 470 practitioners, is an entrepreneurial management template that helps both novice and seasoned entrepreneurs understand the key components of startup and growth. 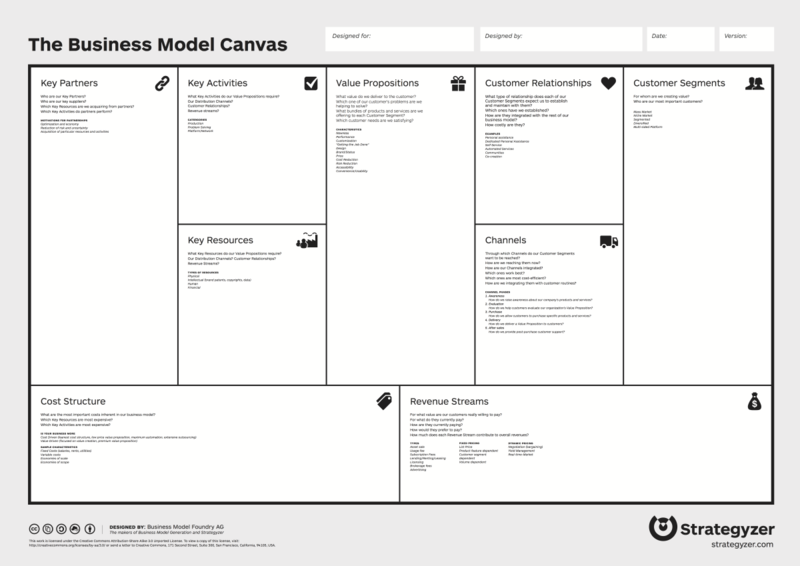 Business Model Canvases have been central to the success of thousands of entrepreneurial ventures around the world, and today you can find copies on walls, whiteboards, and in presentations and boardrooms at startups, nonprofits, and Fortune 100 global companies. Why Do Creative Projects Need a Different Tool? 1. Creative projects are not always entrepreneurial products or services. 2. Individuals in creative disciplines often develop projects with success measured in ways that differ from a company. 3. Business terminology can be confusing and intimidating to those in non-business fields. Innovation strategist Terri Lonier has been using the Business Model Canvas since its earliest days with individuals and organizations in a wide range of disciplines. Her background in the arts, her experience as an entrepreneur and investor, and her training with business model innovators Alex Osterwalder and Ash Maurya led her to realize that the tool could be adapted for artists, designers, and other creative professionals. 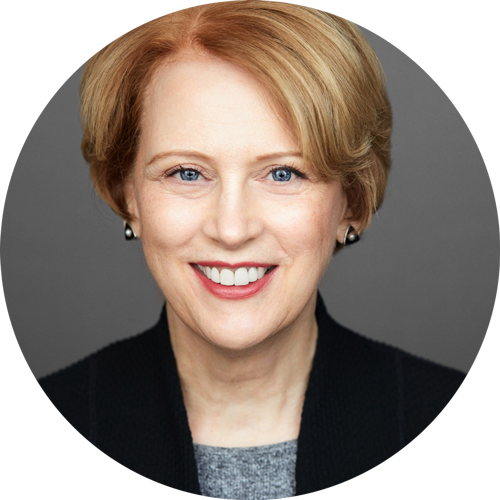 The Creative Canvas was first developed in 2017 and has been tested with hundreds of creatives in art and design studios, MBA students in entrepreneurship programs, and Terri's executive consulting clients in the field. The current version (v3.0) reflects key refinements that make this tool even more valuable as a resource for creative project planning. First download the PDF and print out one or more copies. The file can be printed at any size, although 11x17 inches (tabloid) is a popular option. It allows lots of room to explore your ideas yet can be folded to tuck inside a notebook or file folder. Gather a collection of colored pens, pencils, markers, or Post-It Notes. While you can write directly on the Canvas, many like to use small Post-It Notes because they can be changed easily. Feel free to use words, drawings, charts, diagrams or whatever else inspires you. Find some room to spread out in a quiet area. Bring along any notes or other materials you need to chart out your creative project. A complete step-by-step guide is contained on the back side of the canvas. The Creative Canvas was developed by Dr. Terri Lonier. It is adapted from The Business Model Canvas (www.businessmodelgeneration.com) and is licensed under a Creative Commons license. Version 3.0, 2019.